Oblivion Days is the brand new studio release from California's progressive rock masters Rocket Scientists. Combining their familiar blend of studio mastery with both vintage and modern musical elements, the album displays considerable growth and evolution from the band's previous releases. This growth is a result of Rocket Scientists' touring and recording experience acquired over the last four years since the previous studio release, 1995's Brutal Architecture. Oblivion Days is the fourth album from Rocket Scientists. Their debut album, Earthbound, arrived in 1993 displaying a breathtaking blend of pop and progressive elements: solid songwriting and production combined with progressive arrangements and symphonic sounds. The second album was Brutal Architecture, which was released in 1995. Brutal Architecture took the band into more progressive waters with longer tracks and more experimental compositions including the 11:30 long epic "Mariner". The band toured Europe in 1997, participating in several progressive festivals and club dates in England, Holland and Germany. This 1997 tour resulted in the third Rocket Scientists CD, a live album entitled Earth Below and Sky Above: Live in Europe and America along with its companion video, Rocket Scientists: Live in Bruchsal. 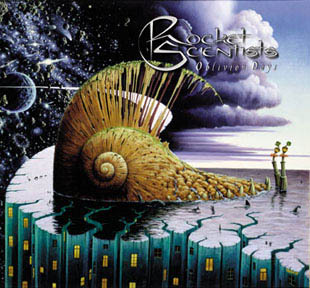 Beginning in 1998, Rocket Scientists became an integral part of the recording and live sound of symphonic rock vocalist Lana Lane. The four - member Rocket Scientists lineup of Brutal Architecture and Earth Below and Sky Above toured with Lana in Japan and the US, appearing on her Live in Japan CD as well as several Lana Lane studio albums including Garden of the Moon and Queen of the Ocean. Oblivion Days contains a live bonus track of the Brutal Architecture song "Wake Me Up" recorded live at a club date in Tokyo while on tour with Lana Lane in April of 1999. Rocket Scientists' involvement with Lana Lane affected the band's sound significantly. Whereas Brutal Architecture featured a more acoustic and vintage sound, Oblivion Days adds the weight and drama of powerful rock guitars and heavier drum tracks. These added modern dramatic elements combined with the vintage elements of Mellotron, Hammond organ, Moog synthesizer and E-bow guitar result in a powerful symphonic experience rich with depth and color. In order to achieve this sonic expansion for Oblivion Days, core members Mark McCrite and Erik Norlander enlisted several additional musicians to deepen these symphonic colors. Lana Lane guitarist Neil Citron also appears, contributing his fluid and melodic solo style as well as his fiery rhythms. Also from the Lana Lane camp, a guest appearance is made by fretless bassist Tony Franklin, known for his work with The Firm and Blue Murder in addition to Lana Lane. Drummer / percussionist Greg Ellis participates on the album as well. Ellis is known for his work on Erik Norlander's solo albums, Threshold, Seas of Orion and Into the Sunset as well as his percussion with the world music group Vas and also Mickey Hart of Grateful Dead fame. Lastly, the queen of symphonic rock herself, Lana Lane makes an appearance on the album contributing her angelic vocals to the harmonies of several tracks. In addition to these guest musicians, the familiar Rocket Scientists rhythm section of bassist Don Schiff and drummer Tommy Amato again appear on Oblivion Days. Schiff of course plays his well - known Chapman Stick on the record, but he also adds to his arsenal the new prototype NS/Stick instrument as well as his old faithful Rickenbacker conventional four - string bass. The center of Rocket Scientists is vocalist / guitarist Mark McCrite and keyboardist / producer Erik Norlander. McCrite brings vintage and melodic influences to the band -- everything from The Beatles to The Moody Blues to Crowded House. McCrite's love of both melody and harmony adds compositional richness and sophistication to the Rocket Scientists sound. Contrastingly, Norlander contributes the more progressive, symphonic and rock elements -- influences from Emerson, Lake and Palmer to Procol Harum to Deep Purple. In fact, the title track from Oblivion Days was originally written for ELP, but Norlander chose instead to use it for Rocket Scientists when ELP announced one of their many breakups in early 1999. McCrite and Norlander have worked together for over 15 years since the two attended high school together in the mid-1980's. Oblivion Days contains an expansive collection of tracks all centered around a strong sonic concept. Tracks such as "Aqua Vitae", "Banquo's Ghost" and "Escape" move from spacious acoustic introspection to full - speed progressive fireworks. Other tracks such as "Oblivion Days" take a more heavy and dramatic approach right from the start. As one would expect from Rocket Scientists, there are several instrumental tracks on Oblivion Days as well. The band continues the "Dark Water" theme begun on Brutal Architecture with "Dark Water Part Three: Neptune's Sun" and "Dark Water Part Four: Heavy Water". As with Brutal Architecture, there are also two signature instrumental pieces each composed individually by McCrite and Norlander: McCrite's "Compass Variation" and Norlander's "Archimedes" continue in the tradition of Brutal Architecture's "Nether" and "Copernicus". Lastly, Oblivion Days features a dramatic cover of the 70's TV series theme, "Space:1999". The song was chosen both for its timeliness ("1999") and its reference to "Space" -- a subject certainly suitable for a band called Rocket Scientists. Oblivion Days is an exciting journey through a vivid realm of sound, style and substance. Featuring astounding cover art by Lana Lane artist Jacek Yerka, the album delivers a stunning blend of the surreal and the symphonic. With Oblivion Days, Rocket Scientists once again show that progressive rock is alive and well and headed into the 21st Century. Oblivion Days was originally released in 1999 on the Avalon label in Japan and on the Transmission Records label in Europe. The Transmission Records version is now out of print. The Avalon (Japanese) version contained the bonus track, "Compass Variation", while the Transmission (European) version contained the bonus track, "Stardust - MM96 Mix", a variation on the 1995 "Stardust" track that appeared on the Brutal Architecture CD. Both editions contained another bonus track, "Wake Me Up - Live in Tokyo 1999". (30 December 2007) A remastered version of Oblivion Days has been released as part of the Looking Backward multimedia box set in December 2007. The remastered version contains all three bonus tracks, "Compass Variation", "Stardust - MM96 Mix" and "Wake Me Up - Live in Tokyo 1999". You can download the remastered version of Oblivion Days on ReverbNation and iTunes complete with all three bonus tracks.